By Jim Purpura. Posted October 25, 2012, 8:12 PM. Conditions are ripe for the first strong Santa Ana wind event of the season. The trough of low pressure responsible for the cool weather, light rain and drizzle early in the week has moved east and is being replaced by high pressure aloft. At the surface, a cold dome of high pressure is surging back to the southwest toward southern California. The surge of cold will mean cool Santa Ana winds in the mountains and deserts, and very warm windy weather in the Inland Empire as the air is pushed downslope west of the mountain and warms. Look for strongest east winds to begin after midnight and begin to subside after noon Friday. Wind gusts could be near 60 mph across the Banning Pass and below the Cajon Pass. In the mountains look for the strongest winds just downwind, or west, of the ridge tops. Top gusts in most of the Inland Empire will be between 30 to 40 mph, with stronger winds just west of the mountains. Related to the wind will be fire danger and low visibilities. Strong winds, low humidities and very warm temperatures will combine to create high fire danger, and the National Weather Service has issued a Red Flag Warning for the Inland Empire and mountain areas of San Diego, San Bernardino, and Riverside County through Saturday evening. Strong winds may lower visibilities in blowing dust. Warm weather will continue through Monday, but the strongest winds will have long subsided. 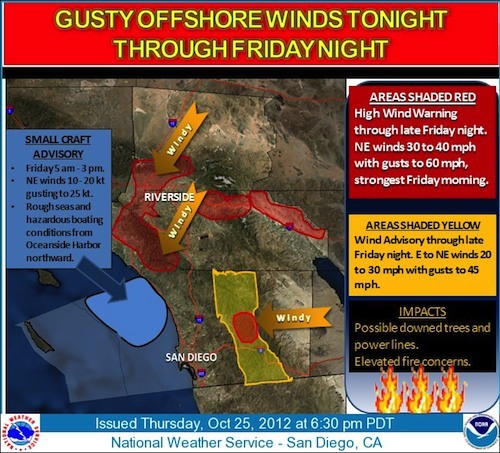 Friday's Santa Ana Wind Event. Courtesy National Weather Service.